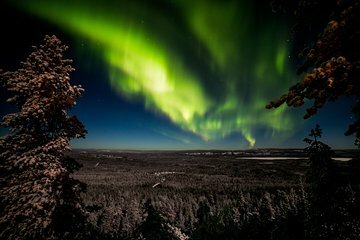 Cace as luzes do norte para capturá-las na câmera nesta excursão de fotografia de grupo pequeno de Rovaniemi. Viajando de minivan com ar condicionado e com um fotógrafo profissional, siga para os melhores locais de visualização, escolhidos de acordo com as previsões do tempo do dia. Em seguida, caminhe até os pontos de vista exatos para uma sessão de fotos guiada e, com sorte, obtenha fotos inesquecíveis. Headlamps, thermals, refreshments, e Rovaniemi hotel pickup e drop-off incluídos, com os participantes aconselhados a trazer uma câmera DSLR. I enjoyed this trip although we didnt see the lights. We learnt some valuable techniques for night photography and have a stunning photo from the trip. It will stand us in good stead on our quest in Sweden again this week. Even if we didn’t see the auroras, it was still a fun tour and the guides made you feel like they really want you to see the lights. They take extra efforts to take you places with better chances and make you feel comfy throughout. Worth it! It was great. Tour guide was extremely knowledgeable in photography and very friendly, I mean he even brought snacks for crying out loud. Money well spent!